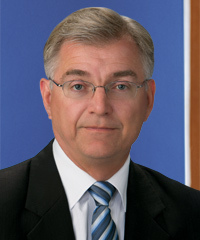 David is a Senior Vice President and Client Advisor in Whittier Trust’s South Pasadena office. He has a wide range of experience and expertise in the trust and estate planning arena. During his 28 year career he has exclusively been focused on trust and estate planning issues. Dave has a Bachelor of Arts degree in economics from UCLA. He holds the Certified Financial Planner designation and has taught estate planning at the UCSB Extension. This experience and education enable him to assist clients in managing their estate plans and executing complex trust provisions. Dave understands that the client’s attorney, accountant, and investment manager all play key roles in successfully creating, implementing, and monitoring an estate plan. His experience as a manager both at Sanwa Bank and at Wells Fargo, as well as his years in the industry, have instilled a collaborative approach to solving client needs. Dave is affiliated with several professional groups. He is a member of the Certified Financial Planner Institute and the Glendale Estate Planning Council. Dave is past president of the San Luis Obispo Estate Planning Council 2000-2002. When Dave is not at work, he enjoys gardening, hiking, and spending time with his wife Georgia and their children.